Samsung will be unveiling its a new soundbar called HW-K950 at CES 2016. The device will feature Dolby Atmos technology and enhancements to its Wireless Audio 360 audio series. The HW-K950 package the Samsung’s first to include two Dolby Atmos enabled wireless rear speakers. It also features 5.1.4-channel sound and is just 2.1-inches high. The HW-K950 uses three forward facing and two upward facing speakers and can connect wirelessly to the subwoofer and rear speaker units. Samsung Electronics, the leader in home entertainment, announced its new portfolio of audio products, including a groundbreaking new Soundbar featuring Dolby Atmos® technology, and enhancements to its Wireless Audio 360 audio series. The new Samsung audio product roster is designed to deliver spectacular sound for a truly next-generation experience. CES 2016 attendees can hear Samsung’s new audio lineup for themselves, and see many more innovative home entertainment products at the Samsung Booth, #11906 in Central Hall. Samsung’s new HW-K950 Soundbar is the company’s first to feature Dolby Atmos® technology, and the industry’s first soundbar package to include two Dolby Atmos®-enabled wireless rear speakers. The complete HW-K950 package delivers incredible 5.1.4-channel sound. At just 2.1” high, the HW-K950’s slim and sleek design uses three forward-facing and two upwards-facing speakers to produce a rich, full sound that is big enough to fill the room, yet detailed enough to deliver realistic, cinematic sounds, from an arrow shooting across the room to a hummingbird flying overhead. The Soundbar also connects wirelessly to the subwoofer and rear speaker units, for a practical and seamless solution in any living room. This also means that ceiling-fitted speakers are not required for moving, 3D audio. 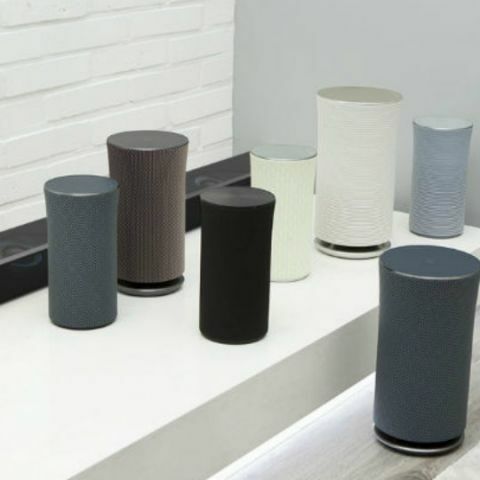 Building on its Wireless Audio 360 series, Samsung showcased a variety of new colors and patterns for the audios, designed to complement the décor of any room and bring audio content throughout the home. With proprietary Ring Radiator technology, the audio can be placed anywhere and still fill the room with vibrant, yet balanced sound. Samsung also makes it easier than ever for customers to control their music simply and easily with the speakers’ touch-enabled, intuitive tap and swipe interface. Consumers have even greater control with new apps for the Gear S2 and Gear S smartwatches, and an improved Samsung Multiroom App for smartphones and tablets. The Wireless Audio 360 Series also offers new smart home functionality, including audible notifications and home cinema settings. The R5 model of the Wireless Audio 360 series has also been recognized as an honoree in the CES 2016 Innovation Awards. Samsung will continue to build on its market leadership position and develop more state-of-the-art home audio products at the company’s Audio Innovation Lab in Valencia, California. How to become good at taking candid photographs? best phone to buy at Rs.13,000 budget? Best app to kill android applications running at background ?